After half a decade on Wall Street, Michael Kane started his own craft brewery in Ocean, N.J. in 2011. Michael Kane went from poring over spreadsheets to pouring craft beer with his name on it. The former Wall Street investment banker is part of a growing club of Americans who have ditched their boring day jobs to start craft breweries. "I wasn't totally passionate about analyzing accretion solutions for merging hedge funds. I wanted to do something I was totally vested in and loved," Kane told CNNMoney. Nearly four years after launching Kane Brewing Company on the Jersey Shore, Kane, 38, has no regrets. "I absolutely enjoy it. I don't feel like I'm working. Hopefully this is the last job I'll ever have," he said. That doesn't mean starting a successful brewing business is all fun and drinking games. Future brew masters should consider the following advice before jumping in. Plan for lots of delays: Starting a brewery from scratch is incredibly time-consuming. 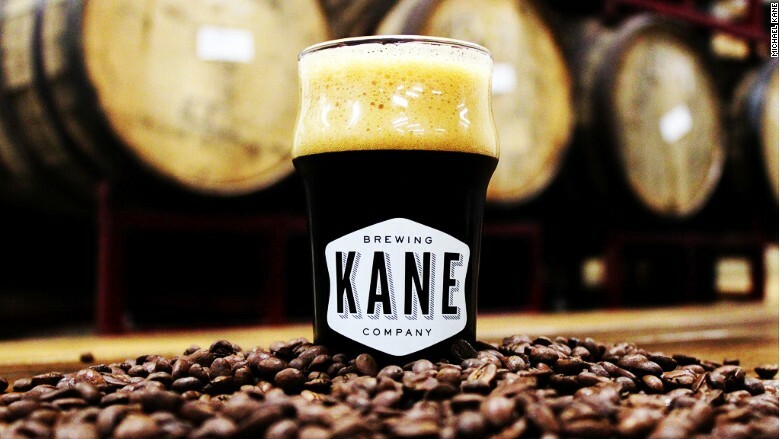 Kane already had his business plan written, money raised and equipment purchased, yet it still took a year-and-a-half to get his Ocean, N.J. brewery off the ground. "Everything is three times as expensive and takes twice as long as you think," said Kane. That's partially due to a tremendous amount of paperwork that goes along with opening a business in one of the most highly taxed and regulated industries in the country. Related: Bud mocks craft beer but it owns microbrews! Keep a capital cushion: Due to heavy demand from other brewers, new entrants should also brace for long wait times to get their hands on the expensive equipment. It also takes time to figure out how to get the beer to market. All of this explains why it's crucial for new breweries to open with ample working capital beyond the initial start-up costs. "You want that cushion. You need the cash to get through the unprofitable times," said Kane. Don't be stingy: Craft brewing is a very capital intensive business. That means even when breweries are profitable from an operations standpoint like Kane's now is, excess earnings need to get poured back into the business. Last year Kane spent heavily on massive fermenters. This year, he's in the the process of a 5,000 sq. ft. expansion that includes moving the tasting room and visitor center into a new space. The brewery also has nine full-time and eight part-time staff members. "You're never really done investing in this business," said Kane. Kane declined to specify exactly how much money he raised before launching, but said it's a "sizable commitment of capital," especially since he took on no outside investors to maintain total control of the business. Quality matters: Craft beer is no longer a secret. 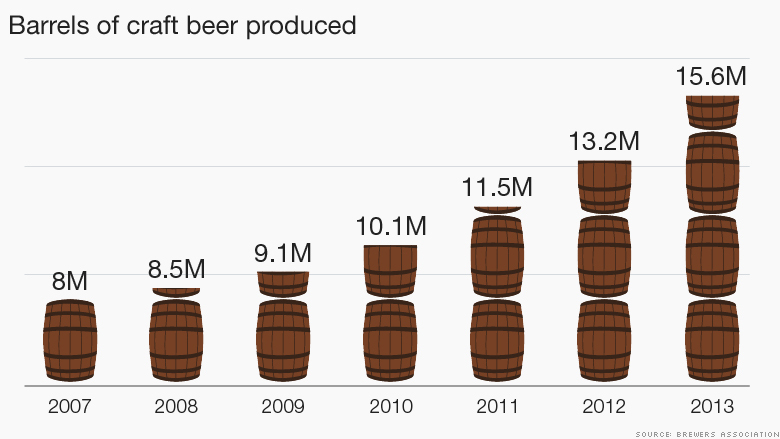 Between 2007 and 2013, the amount of craft beer produced in the U.S. nearly doubled to 15.6 million barrels, according to the Brewers Association. Craft beer -- which is defined as small, independent and traditional beer -- now holds nearly 8% of the total volume share. The increased competition elevates the need to make beer that people actually want to drink. "If you're not in this to make quality beer, then don't waste your time," said Kane, who brews American style and Belgian influenced ales that are unfiltered and unpasteurized. Julia Herz, the Brewers Association's craft beer program director, said the most successful ventures are highly organized on both the business and quality fronts. "You can't just make beer and people fly through the doors," she said. But this doesn't necessarily mean the craft beer industry is too crowded. Herz said 94% of U.S. breweries make less than 15,000 barrels of beer a year and the majority don't even distribute outside of their state. "There is so much room for growth. We're a beer-loving nation first and foremost," said Herz.